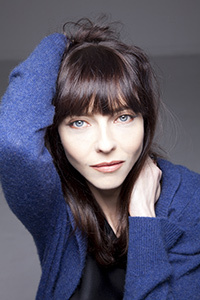 LOS ANGELES, Calif., — Runic Films and Little Empire Productions are very happy to announce that Juliet Landau has joined the cast of their forthcoming science fiction short film Hashtag. Juliet will be the voice of “T’ea”, the omnipresent computer system in the Hashtag world. A superlative actress on screen, on stage, and in animation, video games, and audio dramas, Juliet has appeared in some of the biggest films, series, and franchises. Juliet is known for many roles including “Drusilla” in Joss Whedon’s Emmy and Saturn award-winning series Buffy the Vampire Slayer and Angel, and “Loretta” in Tim Burton’s Oscar winning Ed Wood. She has also supplied the voices for numerous animated films including several in the DC Comics universe, and TV series including Ben 10, Justice League, Green Lantern: The Animated Series and more. Juliet also voiced several memorable video game characters including the “Little Sisters” from the award-winning Bioshock series. Doctor Who and audio drama fans will also know Juliet as “Romana” from Big Finish’s The Companion Chronicles and Gallifrey ranges. As a director and producer, Miss Landau has been working on a duo of feature documentaries about vampires, A Place Among the Undead and A Place Among the Dead. She is currently gearing up an IndieGoGo campaign for Undead, a “first of its kind” gathering the Who’s Who of the genre. With an impressive list of interviewees never seen together in one film, you can sign up to be notified about the campaign at http://www.aplaceamongtheundead.com/. “Neither can I!” enthuses Juliet. Juliet joins Hashtag stars Gigi Edgley, Erryn Arkin, and Simone Alex in The Twilight Zone-like short film about a future dominated by social media and technology. Hashtag, from co-writer/director Ben Alpi, producer Jyotika Virmani and co-writer Kevin Rubio, was successfully funded on Kickstarter.com in December 2014 and is currently in post-production. Hashtag is a co-production of Runic Films and Little Empire Productions.